Security forces stormed the Egyptian Centre for Economic and Social Rights (ECESR) late Wednesday night, arresting at least one and confiscating laptops and other materials from the centre, ECESR reported on its Facebook page. Photographer Mostafa Eissa, who was in the ECESR's Downtown office during the raid, was named by ECESR as the person arrested. There has been no official statement from authorities on the reasons for the raid. 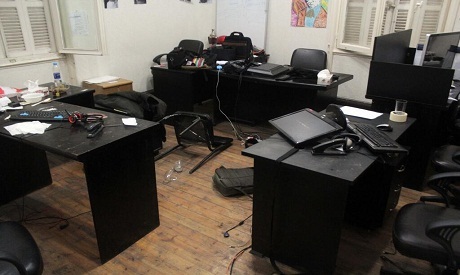 The ECESR, founded by human rights lawyer and former leftist presidential candidate Khaled Ali, shared online a photo of one of the offices in the centre showing computers smashed during the raid. Later, researchers in the centre and human rights activists reported that five researchers were arrested, including leading April 6 Youth Movement member and volunteer researcher Mohamed Adel. "All the five detainees from the Egyptian Centre for Economic and Social Rights have been released now, except Mohamed Adel, volunteer researcher in the centre," said a tweet on the ECESR's Twitter account early Thursday. Egypt's prosecutor general had already issued an arrest warrant two weeks ago for Adel, accusing him of organising an unauthorised protest at Abdeen along with activists Ahmed Maher and Ahmed Douma, who are currently detained pending investigations. Than they came for me .... Looks like this famous phrase completely fits on Egyptian people who are suffering and going to suffer under this fascist regime. Long live Sisi democracy! Now, it is clear that the MB was correct. I wish I had died before demonstating against the Ikhwan and Mursi.